Opening tough nuts can be a real challenge. While it isn’t an everyday occurrence, it helps to be prepared at all times. Having the right tool is important. As trivial as it may sound, it pays to have a nutcracker at home. After all, you’ll never know when you’re going to need one. 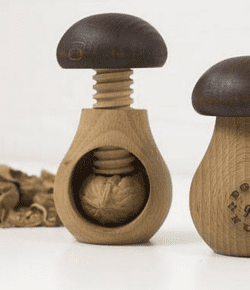 This is a perfect gift for nut lovers! I once received a nice little nutcracker as a gift. We got to use for a few times before it broke. And because I’m such a stickler for details, I wanted to make sure we have a replacement. Instead of buying a nutcracker that I know won’t last for long, I asked my husband to make one. This is a small project with big benefits. I like that it’s simple and easy to make, with absolutely no heavy machinery or high-power tools involved. You can make several of these and give them away to friends and family. They’d appreciate a gift that’s not only durable, but made with love, too. Check out this Instructable to learn how to make a DIY big screw nutcracker.